"Ashildr, a young Viking girl, died helping the Doctor and Clara to save her village. Brought back to life by the Doctor using alien technology, she is now immortal The Woman Who Lived. Since then, Ashildr has kept journals, detailing her extraordinary life. The stories in The Legends of Ashildr are selections from these journals. 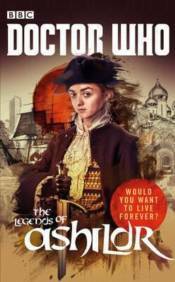 It offers a remarkable glimpse into Ashildr's adventures over her first three hundred years, from enduring the Black Death in London to pirate voyages through the mythical Fortunate Isles. * Featuring Ashildr, as played by Maisie Williams. The Legends of Ashildr is set between her first two encounters with the Doctor, as shown in the 2015 episodes The Girl Who Diedand The Woman Who Lived." About the AuthorJustin Richards (Author) A celebrated writer and Creative Consultant to the BBC Books range of Doctor Who books, Justin Richards lives and works in Warwick with his wife and two children. When he's not writing, he can be found indulging his passion for inventing, reading and watching far too much television. James Goss (Author) James Goss is the author of two Doctor Who novels: The Blood Cell and Dead of Winter, as well as Summer Falls (on behalf of Amy Pond). He is also the co-author, with Steve Tribe, of The Doctor: His Lives and Times, The Dalek Handbook and Doctor Who: A History of the Universe in 100 Objects.While at the BBC James produced an adaptation of Shada, an unfinished Douglas Adams Doctor Who story, and Dirk is his award-winning stage adaptation of Dirk Gently's Holistic Detective Agency. His Doctor Who audiobook Dead Air won Best Audiobook 2010 and his books Dead of Winter and First Born were both nominated for the 2012 British Fantasy Society Awards. Jenny T. Colgan (Author) Jenny T. Colgan has written 16 bestselling novels as Jenny Colgan, which have sold over 2.5 million copies worldwide, been translated into 25 languages, and won both the Melissa Nathan Award and Romantic Novel of the Year 2013. Aged 11, she won a national fan competition to meet the Doctor and was mistaken for a boy by Peter Davison. David Llewellyn (Author) David Llewellyn was born in Pontypool in 1978. He is the author of three previous novels, 'Eleven', 'Torchwood: Trace Memory', and 'Everything Is Sinister'. He lives in Cardiff.